Untouched powder is a beautiful thing. Many Utah resorts give easy access to side-country or backcountry terrain, however, that doesn't mean everyone is qualified. You must be completely aware of current conditions and be prepared for anything by using the proper tools, backcountry gear and information. Do yourself a favor and use the Utah Avalanche Center as a primary resource. 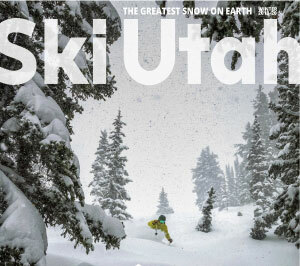 We also highly recommend signing up for Ski Utah's guided Interconnect Tour. There's no better way to go beyond the ropes and ski a side of Utah few get to experience. Please remember, as an uphill skier, you are a guest of these resorts. Please respect their policies, employees, and patrons in order to keep this uphill privilege available. Choose your skin track to maximize visibility to other traffic while still maintaining a safe distance from such traffic. In low-lighting conditions, think along the lines of bicycle safety, with a solid white headlamp in front, blinking red light(s) in back, and reflective clothing. Remember that these are policies for uphill travel within the ski resort boundary, as opposed to backcountry access, which requires utilization of safe backcountry travel skills through potentially dangerous terrain. Alta no uphill traffic allowed during operating dates. Allowed pre and post season except when marked by sign at the base. Brightonuphill travel is allowed with restrictions. Go to Brighton's policy page for details. Snowbird does not allow unauthorized uphill travel during winter or spring operations. Call the Snowbird Activity Center for more information at (801) 933-2137. Due to an increase in uphill hiking, skinning and biking, Snowbird is implementing a new uphill travel policy effective February 1, 2015. Skinning, splitboarding and biking are not allowed at Snowbird during winter and spring operating seasons. Unauthorized uphill travel also includes hiking without a Snowbird guide. To arrange a Snowbird guide for uphill hiking call the Snowbird Activity Center at (801) 933-2147 at least 24 hours in advance. Hiking without a Snowbird guide is not permitted during winter and spring operating hours. Solitude does not allow unauthorized uphill travel within the Special Use Permit Area that is the resort area boundary during the winter operating season. Wild Wild Wasatch Hit the Craziest Lines in Utah!